“Again, you have heard that it was said to the people long ago, ‘Do not break your oath, but fulfill to the Lord the vows you have made.’ But I tell you, do not swear an oath at all … All you need to say is simply ‘Yes’ or ‘No’; anything beyond this comes from the evil one (Matthew 5:33-37). On the other hand, my heavenly Father never says, “I’ll do what I can.” He says, “I will.” And He fulfills all His promises because He cannot lie. I’ve experienced enough of His promises in my life to trust His word. Nevertheless, God’s promises don’t always come as quickly as we thing they should as was case of the readers of Peter’s second letter. 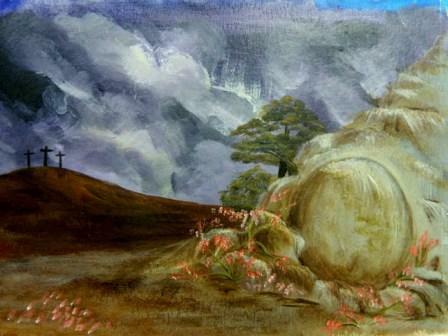 The Christians in Peter’s day understood and believed Jesus’ promise to return on a cloud. But they expected Him to come back within a short period of time. Time has not changed our hope. Every generation since Jesus’ ascension waits with expectancy on the Lord. And with each new generation, a new group of scoffers and mockers rear up, questioning the promise and pointing to the delay. Even my grandmother, a Christian woman, remarked more than once, “I remember them talking up Jesus coming back ever since I was a small child, and He hasn’t come yet.” Unfortunately, she became a scoffer in her old age. Yet to the scoffers of all generations, Peter’s word resound … “The Lord is not slow in keeping His promise … It’s for your benefit He tarries. He’s waiting for you to spread the word, to bring everyone who is willing to repentance” (paraphrased by me). With that hope, I’m looking up, expecting to see Jesus on a cloud any day now. How about you? What must you do to help prepare the way for Jesus’ return? He’s waiting for you. Next time, we’ll look at the gift of victory via the video, which shows the completed picture I’ve been developing since the beginning of December. Prepare by studying 1 John 5:1-12. There are mornings I get up, read my Bible, and pray. Then there are mornings I get up, read my Bible, and ZZZZZZZZZZZZZ. I seem to sleep well enough. But when I read, my eyes become tired and before I know it, I’m snoozing rather than praying. The phenomenon of sleep doesn’t restrict itself to morning devotion time. It overpowers me in mid-afternoon or evening without warning. I’ll be writing on a project or chatting with one of my daughters on Facebook … next thing I’m aware of … an hour later … my daughter’s message: Mom. MOM. Did you fall asleep again? I remind myself of two of my great-aunts who were talking on the phone until one no longer answered the other. This caused a rift between the sisters. Apparently the one who continued the conversation thought the other one had hung up on her. The problem resolved itself, however, when the talker went to her sister’s home to give her a piece of her mind face-to-face and found her sister fast asleep still clutching the phone. True story. No kidding. Obviously my ability to fall asleep during inopportune times is inherited. But I’m still perplexed by it, especially when I think about sleeping over one-third of my life away. It seems like such a waste of precious time. And I’ve become more painfully aware of the precious, fleeting minutes of my life the older I get. Yet, God, in His infinite wisdom, programmed us to need rest. It was so important to Him that He gave us the example by resting Himself on the seventh day of creation (Genesis 2:2). Then He declared the Sabbath Day holy, and we should show reverence by resting from our work on the seventh day of the week as well (Exodus 20:11). Although scientists have performed many different types of experiments which have confirmed our need for rest, many people don’t seem to understand the rest God prescribes entails more than mere physical sleep. These are a few culprits that weary the soul and vex the spirit. The world acknowledges our need for relief and offers solutions like yoga, transcendental meditation, and other various forms of emptying our minds. These sources provide temporary comfort for the moments we spend in that state. When we return to reality, our weariness and stress returns as well. But Jesus Christ offers more. 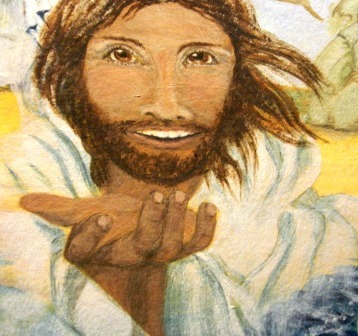 He bids us to come to Him, give Him our work, our personal concerns, and yes, even world issues. In return, He carries and tends to them for us. Thereby, He gives us rest for our souls—continuous, uninterrupted, peaceful rest. How about you? What do you need to give to Jesus in order to experience the rest He offers? Next time, we look at the gift of promise. In preparation, please read and think about 2 Peter chapter 3. Before writing this post, I took the time to read the story behind the poem. Mr. Longfellow knew little peace after the death of his beloved wife who died from burns sustained when her dress caught fire. Mr. Longfellow tried desperately to rescue his wife to the point of wrapping her in his arms to smother the flames, thereby, suffering severe burns himself. Almost a year later, he received word that his oldest son, Charles, had been shot and seriously wounded in the war. It wasn’t until the Christmas of 1864 that Henry Wadsworth Longfellow penned the words to that beautiful Christmas favorite. His wife was still dead, his son was crippled for life, and the Civil War raged on. But Mr. Longfellow found peace in the midst of despair. Peace … not as the world gives … but as our Lord offers. “I have told you these things, so that in me you may have peace” (John 16:33a). In Jesus, we find hope and peace … His gift to all believers. No matter our circumstances, we can experience an inner peace that calms our thoughts and affirms our faith. “But take heart! I have overcome the world” (John 16:33c). Be encouraged! Even though times are tough, evil runs rampart, and nothing makes much sense any more, Jesus is in control. He overcame suffering, death, and the enemy. He will empower each of us to do the same. All we have to do is put our trust in Him as did Mr. Longfellow and so many others. How about you? Can you sing the final verse of “I Heard the Bells on Christmas Day” with the blessed certainty of the poet? Next time we’ll examine the gift of rest. In preparation, please read and meditate on Matthew 11:28-29. Many of us celebrate Christmas with a hope of receiving something we long for but haven’t bought for ourselves. After we tear off the paper, open the box, and clasp the item, we no longer hope for it. We own it. It’d be silly to say we’re hoping to receive what we are already holding in our hands. Unfortunately, we often put the item in its place and immediately dream of something else. We never seem completely satisfied. Maybe that’s where New Year’s resolutions came into play. We weren’t satisfied with the previous year or years for that matter. The beginning of a new year marks a time of reflection on the past. In doing so, we recognize all the areas we could have, should have, would have done “it” differently with better results. So we resolve to improve our behavior, achieve more, give more, study harder, pray fervently, and just become all-round better people. Yes, we enter the New Year with high hopes and great expectations. But somewhere along the way, we lose that drive. The days meld into months. Our new determination dwindles. And we find ourselves entertaining the old thought patterns and habits. Not much, if anything has changed. Yet, when this year ends, most of us will repeat the process with as much enthusiasm as we had in the beginning of this year. Let’s never lose hope in ourselves. More importantly, let’s never lose hope in Jesus Christ as some have. Year after year, 2000-years’ worth in fact, people have looked forward to His return … patiently waiting with more hope and enthusiasm than we can muster for self-improvement in the coming year. But not everyone maintained that hope. 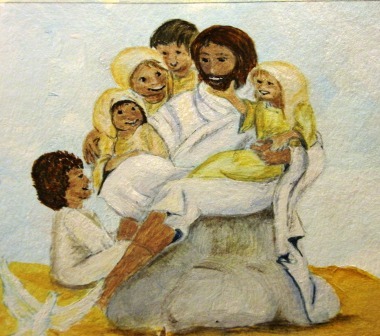 I remember my grandmother saying, “They’ve been talking about Jesus’ return since I was a little girl. He hasn’t come yet.” She became skeptical in her old age. What a shame to have lost the one thing we should hold closest to our hearts—the hope of Jesus’ return. If Jesus didn’t mean He’d physically return to gather His elect and to rule on earth as the King of kings, He lied when He said, My Father’s house has many rooms; if that were not so, would I have told you that I am going there to prepare a place for you? And if I go and prepare a place for you, I will come back and take you to be with me that you also may be where I am (John 14:2-4). If He lied about coming back, then He cannot be trusted about anything He said or did. Personally, I believe every word that was recorded about Him right down to His return. He may come during my lifetime. He may come seventy-five years from now. I don’t know the hour, the day, or the year. But I do know He’s coming … soon. I also know I will meet Him in the sky as He promised. Either my physical body will be transformed in to my new immortal body. Or my ashes will be reformed. It makes no difference to me. The important thing is I have an unshakable hope in Jesus Christ. How about you? In what have you placed your hope? Next time, we’ll peek inside the Gift of Peace. Prepare by reading and meditating on John 14:23-31. A few days ago, I found myself sitting in the social security office. Unbelievable! I’m at retirement age. How’d that happen? Reflecting on my life, it seems to have been filled with a lot of insignificant activities in comparison to what others have accomplished. My life is filled with unattained aspirations, fading dreams, and just plain failures. But Jesus promised to give me life … and that in abundance. So where is my abundant life? While I have had my share of disappointments, I’ve also enjoyed many of life’s pleasures—an adoring husband, beautiful daughters, marvelous grandactives, a comfortable home, and always enough to eat. If you want to get a little more philosophical, I take great delight in my surroundings—the wonder of the sky, the glory of the mountains, and soothing chirps of birds singing in the morning. I am blessed indeed. But is any of this the abundant life of which Jesus spoke? I think there’s a lot more to the abundant life than “what meets the eye.” Jesus wants to give us peace and joy on earth despite our circumstances. Not only so, He wants to give us the assurance of a better place—a place where we will enjoy His presence for eternity. That’s the abundant life to which Jesus referred. Imagine life with uninterrupted peace and joy. As she walked with Jesus, Mary Magdalene tasted uninterrupted peace and joy. But then the cross stripped her of the abundant life. 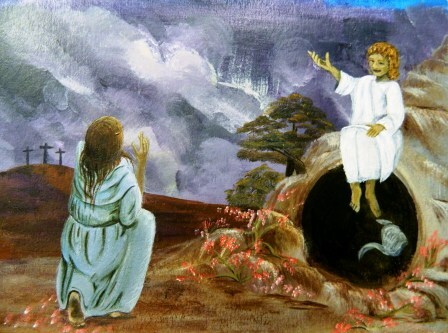 Three long, dark days, she struggled with the hopelessness of the tomb. I believe despair and the remembrance of the horror of demonic possession quickly flooded her mind. What would life hold for such a woman now that Jesus was dead? She couldn’t go back to her life without Him. But where would she could go to find the abundant life He had promised? Yet through her anguish, her love for Him motivated her to do one last act of kindness for the One who showed her the meaning of life. Mary Magdalene, along with several other women, arrived at Jesus’ tomb before daybreak that eventful morning, expecting to perform the ritual of anointing the dead. But the stone had been moved and the tomb open. Inside, sat two men dressed in radiant white garments who proclaimed the resurrection of our Lord. The other women ran back to the room where the disciples where hiding. But Mary Magdalene, struck with grief and confusion, tarried there at the tomb, trembling and weeping. Then He appeared to her—Jesus the creator and sustainer of life in its entirety. And Mary Magdalene experienced the abundant life for which she sought … the abundant life only Jesus can give. How about you? Have you experienced the abundant life through Jesus Christ? Next we’ll peek inside the gift of Light via an art video, which wraps up the past four messages. Prepare by reading and studying John 8:12. Several years ago, my mother, my daughter, and I took a bus trip to New York City during the Christmas season. The window dressings, the lights and decorations in Time Square, and the show at Radio City Music Hall amazed this country bumpkin. But I don’t have to travel six hours on a bus to be awestruck by tinsel and bright lights. A drive around the towns in our area, gawking at the homes all decked out for the holidays strikes the same chords of wonder and amazement within my heart. However grand the most extravagant, man-made decorations are they cannot compare to the brilliant display of angels the shepherds saw the night of Jesus’ birth. And although only two angels appeared to Mary Magdalene and the other women the morning of Jesus’ resurrection, I doubt the shepherd’s wonder and amazement equaled that of the women. The gift of amazement accompanied Jesus everywhere He went. At His birth, through His miracles, upon the cross, and out of the tomb, amazement stirred in the hearts of His followers, causing them to rejoice and glorify the Father. To this day, two thousand years later, His life’s story retold presents the gift of amazement to all who will believe. This gift propels us to spread the good news of salvation through Jesus Christ. How about you? What about Jesus fills your soul with wonder and amazement? Next, we’ll look at the gift of life. Prepare by reading and meditating on John 3:13-18. During my darkest hours of oppression, I learned the meaning of perseverance. Through my thoughts, the enemy tore at the very core of my faith, my purpose, and my self-worth. At first, I had no control over the negative input. He hammered me continuously with all the wrong I’d done throughout my life. He told me I was unlovable and worthless. But somehow within that flood of lies, the Lord spoke the truth. 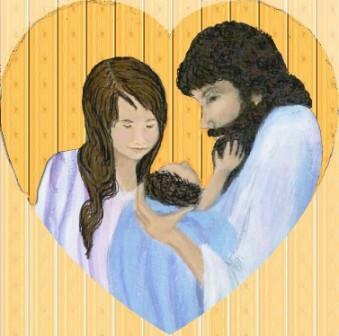 He said He loved me with an everlasting love; with loving kindness He had drawn me to Him (Jeremiah 31:3). The Lord said He had plans for me and would give me hope and a future (Jeremiah 29:11). He told me the truth would set me free (John 8:32). And it did. However my freedom did not come over night. It took effort—perseverance in the battle over my thoughts. Satan was determined to destroy me. But I was more determined to hold on to Jesus’ promises. Holding on to Jesus’ promises was even more difficult for His disciples, I’m sure. They had given up everything to follow Him. And then they watched Him die on the cross. There seemed to be nothing left on which to hold. Yet, they persevered through those spiritually dark hours from the time of Jesus’ death until the morning of His resurrection. Somewhere within the three days of fasting and despair, those who clung to the last milligram of hope discovered the gift of perseverance. Because they hung on where there didn’t seem to be any hope, they saw Jesus resurrected and full of glory. We, too, have hope beyond hope. And if we persevere, we, too, shall see Jesus. How about you? What is enabling you to persevere through your darkest hour? Tomorrow, we’ll consider the gift of amazement. Prepare by reading and meditating on John 20:11-18. I’ve sailed on the ship called Hard often enough. And I seldom, if ever, viewed the experience as a gift from God. 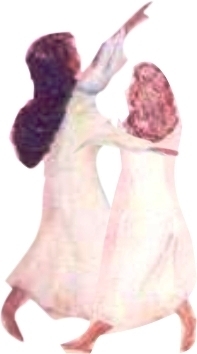 Both my daughters were born with birth defects. To this day, that term grates my spirit even though I know the outcome of their struggles. I felt as though I had done something terribly wrong to have had two daughters with special problems. Some people took it upon themselves to point out that such things come from hidden sin. And as if that wasn’t harsh enough, they added the reason why God didn’t heal Melinda and Rachel immediately was because their father and I lacked faith. Talk about making waves on the sea on which my Hardship was sailing. Likewise, the disciple must’ve felt like they were in the midst of the worse storm they had ever experienced the day Jesus was crucified. They had put all their trust and hopes in this man who claimed to be the promised messiah. Now with the cross behind them and the sealed tomb before them, they faced hardships beyond their ability to do anything, to change their situation. And the gift of hardships lies there in our inability to do anything about our circumstances. The moment we reach that point, God’s glory is revealed and His Son Jesus Christ is glorified. That’s the purpose of hardships—the gift within the experience. The disciples didn’t realize it until they stood before the empty tomb, touched His nail-scarred hands, and walked with Him on the road to Emmaus. But when they did, they saw a new Light shining. They experienced the gift of hardships. How about you? How has the gift of hardships revealed God’s glory in your life? Tomorrow, we’ll consider the gift of perseverance. Prepare by reading and meditating on James 1:2-8. Sacrifice? What do I know about sacrifice? I’ve sacrificed designer jeans for Christmas presents for my daughters. But I’ve never sacrificed to the point of wearing thread-bare Levis. I’ve sacrificed dining at high-class restaurants. But I’ve never gone hungry. I’ve sacrificed traveling abroad. But I have enjoyed a few national parks. What I’m trying to say is we often talk about sacrifices, but many of us have little clue what true sacrifice is. What have our sacrifices cost us? Until we’ve given up the comforts of home to live in a third-world country so they can hear the gospel, our sacrifices haven’t cost us much. Until we’ve poured ourselves out on a daily basis ministering to the needs of others without expecting anything in return, we haven’t experienced sacrifice. Until we’ve suffered persecution, betrayal, and desertion because of our faith, we haven’t felt the anguish of sacrifice. Jesus felt the anguish of sacrifice long before He hung on the cross. When He lay in the manger, He gave up the luxuries of His home to live as in this depraved world so that we could someday live in heaven. He pour out Himself ministering to the blind, the lame, the diseased, and demonically possessed. He suffered persecution, betrayal, and desertion and then hung on the cross until death take away our sins although He was sinless. Jesus gave us the gift of sacrifice. With grateful hearts, we should practice sacrificial giving. Don’t’ misunderstand. We’re not all called to third-world countries to preach the gospel. But we are called to give more of ourselves. I don’t claim to be good at it. I just know I need to work harder on caring for others and allow God to take care of me. How about you? How can you show your gratitude to others for what Jesus has done for you? Surrender: the acceptance of despair; the verbal act of accepting defeat. According to the definition surrender is a negative outcome of a struggle or fight. We probably think of it most frequently in terms of war and associate compromise with the term. However, not every surrender is a compromise nor is it a sign of defeat. But it does mean a shift in priorities. When Gene and I decided to start a family, I surrendered to Gene’s desire for me to become a stay-at-home mom. There was really no compromise or defeat there for me. But I did have to shift my priorities. Being a stay-at-home mom meant sacrifices had to be made. I could no longer pick up and go as I pleased, buy the latest fashions, or sleep in Saturday mornings. It also meant doing without big things like new cars, extravagant vacations, and a hefty retirement fund. To some, my surrender may have looked like a form of defeat and compromise. Nevertheless, I set my focus on the welfare of my children. Nothing I could have earned monetarily speaking could have made up for the time I invested in Melinda and Rachel. They were my primary purpose in life while they were growing up. And they were well worth the sacrifices Gene and I made. Similarly, Jesus felt each one of us was worth the sacrifice as He surrendered to the Roman soldiers. To His disciples, Jesus’ surrender looked like a sign of defeat. They all deserted Him and hid from the guards. To the priests, Jesus’ surrendered looked like a sign of defeat. They rejoiced and gave Judas thirty silver coins as a thank-you. To Pilot, Jesus’ surrender looked like a sign of defeat. Finding the Lord guilty of nothing, the governor washed his hands of the matter. However to Jesus, his surrender meant victory for His surrender was not to His enemy, but to His Father. Only in His surrender, could the Scriptures be fulfilled. Only in His surrender, could Jesus lay down His life and take it up again as He’d said He would do. Only in His surrender could Jesus provide salvation for a lost and dying sinner such as me. I’m grateful beyond words for His Gift of Surrender. 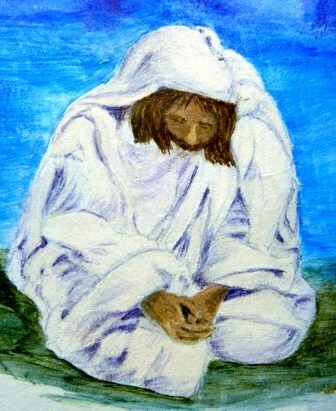 Jesus took His disciples to the Garden of Gethsemane after the Passover meal. Along the way, He spoke to them of the upcoming events, preparing them for His horrific destiny. They asked a lot of questions, but didn’t really perceive the truth in its entirety. At the garden, Jesus instructed eight of His followers to rest while He went on to pray. (Judas had already left the group to report to the priest.) Notice, Jesus did not ask them to pray with Him. I don’t know why. To be honest, I just now noticed that myself. Then He asked Peter, James, and John to continue with Him. However, He, also, told them to “sit here while I go over there to pray” (Matthew 26:38). But He told them to watch and pray. When Jesus returned to His three closest friends, He found them sleeping. Again notice to whom He directs His discourse: “Couldn’t you men keep watch with me for one hour?” he asked Peter. “Watch and pray so that you will not fall into temptation. The spirit is willing, but the flesh is weak” (Matthew 26:40-41). Why did He single out Peter? The others were sleeping too. Jesus knew in just a few hours Peter would fall into temptation. Peter, the outspoken one—the one who vowed to never disown the Lord even if it meant death—that Peter needed to pray more than any of the rest of Jesus’ followers. Peter learned the importance of prayer that night and during the trials ahead before and after Jesus’ resurrection. I’m sure the apostle treasured the gift of prayer more than any other he received. How about you? Do you treasure the gift of prayer? While in the army, my husband supervised the mess hall. Gene took his job seriously and won the respect of most everyone, including the commanding officers he served under. Being an enlisted serviceman, he had to follow the orders of his superiors. However in his kitchen, Gene was the one in charge and even the commissioned officers followed his rules, which included serving the enlisted men and women first. The commissioned officers had to wait, no questions asked. On one occasion, an officer entered the mess hall before everyone else and took a glass of ice water. Gene stopped him and ordered him out of the building. Of course that didn’t go down well with the officer. He took Gene to the commander. Big mistake! The next day that arrogant officer found himself on a plane heading home. He had learned an important lesson—don’t mess with the Mess Daddy. Gene may not have had a higher rank out in the field, but the commanding officer had given him complete authority in the dining facility. And Gene had no problems exercising that authority. Jesus had no problems exercising His authority while on earth. When we entered the temple in Jerusalem and saw dishonest merchants taking advantage of the poor, He took immediate action. Yes, Jesus became angry—an emotion we don’t like to talk about when it comes to Jesus. We like to think of Him as meek, gentle … passive. YIKES! What a poor image of the Son of God. 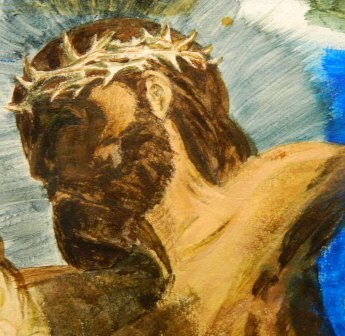 Jesus became angry with a righteous anger. He had the authority to calm storms, cast out demons, and forgive sins. He, also, had the authority to drive the cheating merchants out of the temple. Every one of the gifts Jesus possessed He passed on to us as believers. Authority is no exception. But so many Christian seem to shy away from this particular gift. We show no sign of authority in our families. If we discipline our children, they may hate us. Or we’ll be arrested for child abuse. We show no sign of authority in our workplace. We tolerate course language, inappropriate jokes, and slander against our faith. We show no sign of authority in church. If someone sins, we say nothing. We wouldn’t want to offend and thereby lose another member. We sure show no sign of authority over Satan or demons. We’re not even sure if they exist anyway. But Jesus gave us authority. As parents, we have authority and with it comes the responsibility to guide our children. Discipline is part of that. In the workplace as well as in the church, we have authority and the responsibility to take charge of offensive behavior. And most assuredly, we have authority over Satan. He does exist. He is our enemy. One of his best weapons formed against us is to undermine our authority. How about you? How can you reclaim your God-given authority and exercise it in a Christlike manner? Tomorrow, we’ll ponder the Gift of Prayer. Prepare by reading and meditation on Matthew 26:36-46. When Rachel was learning to ride her bike at the cabin, her dad scream at her to turn around and come back. She did her best to obey, but her little legs couldn’t move her fast enough to suit her dad. He ran after her, picked her off her bike, and threw her inside (her words, not mine). She was scared. She thought she was in trouble. But she soon found out the reason for her father’s strange behavior. He and I had spotted a large bear quite a few yards away. But if he continues on his course, he would’ve ran between Rachel and our cabin. Fortunately, Gene’s actions not only frightened Rachel, they frightened the bear as well. It made a 90 degree turn in the opposite direction. Like Rachel, we all need to do our best to obey those in authority over us, especially God … because sometimes we don’t see the bear running through the tall grass. But obedience doesn’t come easy for many of us. We hesitate to relinquish control. But obedience isn’t about surrendering power/control. It’s about lovingly accepting the authority over us and a pure demonstration of trust. Jesus demonstrated His trust in the only authority over Him when He entered Jerusalem the Sunday before Passover. Jesus knew the people who waved palm branches and sang His praises that day would shout, “Crucify Him!” in just five days. 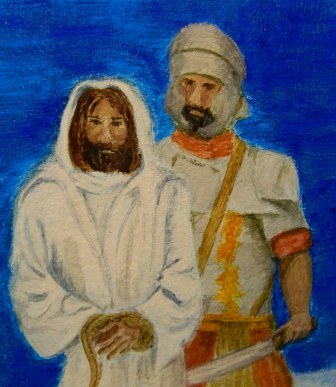 He knew Juda would betray Him and Peter would deny Him. Jesus knew He was on His way to the cross. In essence, Jesus saw “the bear running through the tall grass,” but He trusted the Father and obeyed. Obedience is truly one of the greatest gifts children can give their parents. As it brings honor to our earthly parents, it brings honor to our Heavenly Father as well. How about you? In what areas of your life do you demonstrate your trust in God through obedience? In what areas do you need to show more trust? Tomorrow, we’ll consider the gift of authority. Prepare by reading and meditating on Mark: 15-18. The day I sensed the Lord’s prompting to seek forgiveness from a friend to whom I had spoken unkindly, fears and insecurities crept into my soul. What if she demanded restitution of some sort? What if she totally rejected me? What if…what if I obeyed Christ and placed the outcome in His hands? I finally took up courage and approached my friend. She forgave me. Although our relationship mains somewhat strained, the sweet fragrance of forgiveness fills my soul with gratitude. Gratitude for forgiveness motivated a sinful woman to wash Jesus. feet with her tears. Jesus’ host, a Pharisee, hadn’t so much as given Jesus the customary basin of water to wash his own feet, nor had the Pharisee greeted Jesus with the usual kiss on the cheek. But the intruder anointed Jesus’ feet with expensive perfume and kissed them continuously. The Pharisee was appalled by her actions and more so at Jesus’ acceptance of it. But the Master commended the harlot and reprimanded the religious leader (Luke 7:36-50). The Pharisee was so busy condemning the woman that he failed to see the gift of forgiveness Jesus offered, let alone his own need to receive it. The woman, on the other hand, acted out of faith, love, and gratitude. She knew her sins were many. She also knew Jesus was the only one who could deliver her from that lifestyle to a life of righteousness before God. Her actions pleased our Redeemer. How about you? How can you express your gratitude for forgiveness? Tomorrow, we’ll look at The Gift of Yielding. Prepare by reading and meditating on Matthew 21:1-11. Several weeks ago, Gene and I stopped in to visit the “grandactives.” I peeked in the door as is my habit before I enter. Two-year-old Eli squealed with excitement at the sight of his Pap’s truck. But when he saw me peeking under the window blind his happy face drooped into a scowl. He turned to his mother and said “Bee” in a very disappointed tone. But the excitement soon returned when Pap entered the room. Similarly when Jesus entered a village, excitement filled the air. 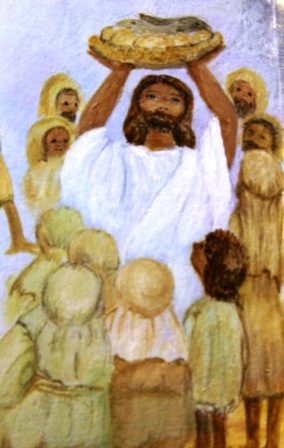 People flocked to the Lord in such large numbers that He often preached on a hillside. Some came seeking a miracle. Others only desired to watch the show. Perhaps some heard about how He fed 5000 men with just two fish and 5 loaves of barley and hoped to be fed as well. Still others wanted to find fault. But there were a few who grasped the truth of Jesus Christ. They received the grandest gift—His presence. Unfortunately, the majority threw away the gift and clung onto the wrapping—the miracles, signs, and wonders He performed. When Jesus spoke about repentance and the cross, many of His followers turned away (John 6:60-71). We are no different. We look for handouts. We think we’re entitled or we deserve the best of everything free of charge. But when it comes time to admit we have faults and truly deserve punishment rather than favor, we walk away in disgust. Yet, Jesus reaches out to us, calling us to Him. How about you? How have you answered Jesus offer of His presence in your life? Tomorrow, we’ll recap this week’s meditations via an art video. By the time I met my husband, I had had enough negative experiences to cause me to be suspicious of everyone, even Gene. But he had soothed my skepticism with one word, “I’m telling you the truth. You choice whether or not to believe it.” Wow! I had a choice to make—trust my husband or not. Our future rested on my decision. I chose to trust him. He didn’t let me down. I had a lot of growing to do in order to develop that trust. But the moment I chose to trust Gene, my life changed. 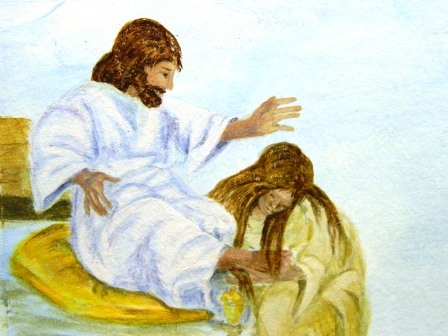 When Jesus told Peter to step out of boat during that horrific storm, Peter had to choice to make—trust the Master or not. The moment Peter stepped out of the boat, his life changed. Yes, Peter’s faith was short-lived. But he trusted Jesus all the same. The disciple had a lot to learn, a lot of growing to do. Nevertheless, he placed is trust in the Master of the storm. Jesus didn’t let Peter down, and his life changed forever. No matter how severe the storm, Jesus is always in control. That day the disciples received the gift of trust. How about you? Have you received the gift of trust? What steps can you take to strengthen your trust in Jesus and significant others in your life? Tomorrow, we’ll examine the gift of Jesus’ presence. Prepare by studying Mark 2:1-2. At our house after all the hoopla of presents, pastries, and people settle down for the day, we have one more gift to present. My husband started this tradition years ago. He personally picked and wrapped the gift. The tag read: for the one who didn’t get enough. You’d think no one would claim such a gift. Who’d have the nerve to admit she didn’t receive enough? But inevitably, one of our daughters would grab the extra present. Ah, but my husband was smart. He always bought something to be shared with the entire family like a box of candy or a game. Sharing a box of candy or a game with a small family isn’t very difficult. But sharing a small lunch with 5000 hungry men plus women and children is quite another story. Yet, Jesus did just that. 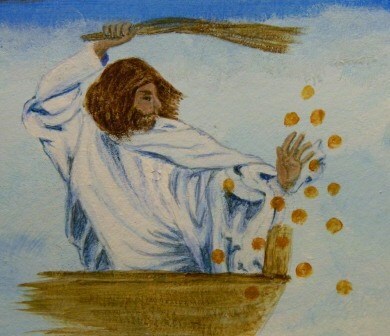 The miracle of the two small fish and five loaves of barley is the only one recorded in all four gospels. God must have something important within this event for us to grasp—something that speaks of His kingdom, His character, and His abundance. In our Father’s house there is enough bread to spare, therefore we never have to fear that we’ll be turned away wanting. How about you? Have you tasted the goodness of Jesus? How can you share His abundant grace this Holiday Season? Today, I’m sitting in a waiting room at a doctor’s office. My mother has a spot of skin cancer on her arm that will be scrapped then sent to the lab. Hopefully … prayerfully, it will only take one scrape to remove all the cells. She’s been through this several times before. Thank God the cancer is not aggressive nor melanoma. It is easily treated and heals quickly. But it seems to pop up other places almost on a regular basis. So periodically, we return to the dermatologist. All the doctors and nurses in this office show compassion during her procedures. However, that is not always the case. Last week, she had to have a lubricating shot in her knee. The doctor refused to give her a shot to numb the area. He insisted he could do the procedure painlessly despite my warnings of my mother’s previous reaction. He showed little compassion and repeatedly commented that the shot couldn’t possibly hurt “that much.” Meanwhile, my mother squeezed my hand until it throbbed. I told her the next time either they would give her a shot to numb her knee or me one to numb my hand. The thing that disturbed me about the ordeal was no logically reason existed for the doctor to put her through such torment other than his own arrogance and to save a few minutes of time. Obviously, some doctors are more compassionate than others. Perhaps, we develop compassion through experience and example. Jesus being our example showed compassion to the multitudes of sick, blind, deaf, and disabled people who constantly flogged Him. He turned no one away. He never rushed past someone in need. He took time to speak to them, to encourage them, and to meet their deepest needs—needs of the spirit as well as the body. Jesus taught more by example than by His insightful and often lengthy sermons. But isn’t that how we learn? Wouldn’t we rather follow a leader who does what he expects us to do? I know I would. 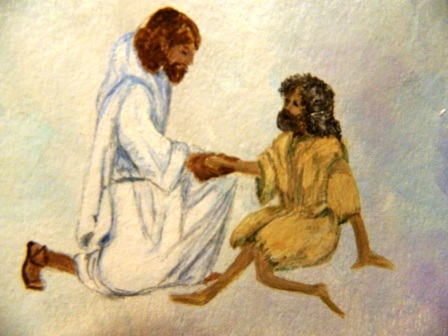 One of the gifts Jesus gives His followers is compassion. And we show our appreciation by showing compassion to others. How about you? How can you show someone compassion this Christmas? This advent season, I had the opportunity to accompany my almost six-year-old granddaughter to the performance of a live nativity. Her reaction was simply marvelous. When the Roman guards arrested a couple of messiah-seeking Jews, she clung to me unsure if she wanted to proceed. Next the wise men observed the king’s star and decided to go on a journey until they found the place of its rest. Sydney gazed at the “star” with curios wonder. We followed the group into the next room to discover a several shepherds preparing to rescue a lost lamb in the dark. 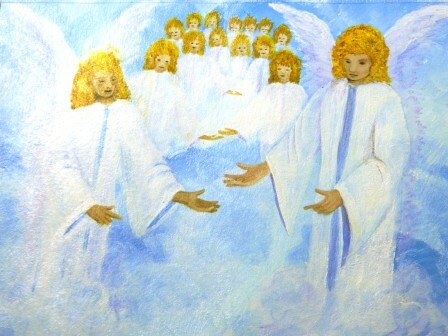 As they discussed the problem, angels appeared above us announcing the birth of the messiah in a small town called Bethlehem. 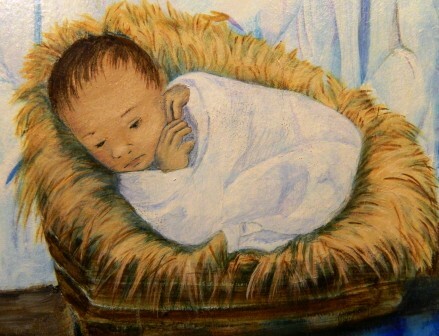 One shepherd said, “Come, let us find this baby the Lord has told us about.” The shepherds rushed out of the room. Sydney was so excited I had to stop her from running after them. And so it went through the entire adventure. Finally, we “found” the baby Jesus lying in a manger, His mother and father standing close-by. Sydney leaned over the rail to get a better look, her eyes filled with adoration and love. This small child’s willingness to believe and her longing to participate shows us exactly what Jesus meant when He said we must receive the kingdom of God like a little child. Children lose themselves in the moment. They don’t ask questions or worry about what others will think. They act without hesitation. They accept the wonder of the miracles surrounding Jesus’ birth without trying to overthink. They understand with their hearts. Nevertheless, don’t misunderstand. Faith in Jesus is far from a mindless act. It is weighing all the evidence, accepting that we cannot grasp it all nor can it all be explained, and still believing miracles happen. How about you? Have you experienced the miracle of Christmas? Tomorrow, we’ll look at another aspect of the example Jesus set for us. Prepare by reading and meditating on Matthew 20:29-34—The Gift of Compassion. Although I know how to swim and enjoy being in water, having someone dunk me backwards took a bit of courage and trust in the individual doing the dunking. 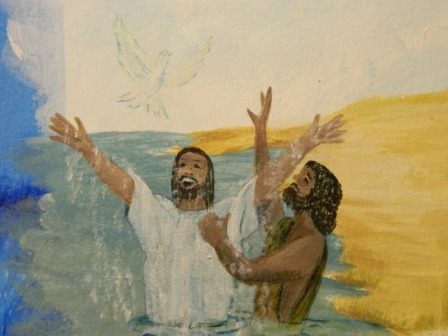 But I wanted to experience the type of baptism I believe Jesus experienced. There’s something about total immersion that is indescribable. I believe it is the element of submission and trust that must be undertaken. Of course, I’m only talking about the physical transaction, not the spiritual. The spiritual transformation is also indescribable. I truly felt cleansed and renewed in my spirit. As it is written, we die to our sin-nature and resurrect a new creature in Christ Jesus. But wait! 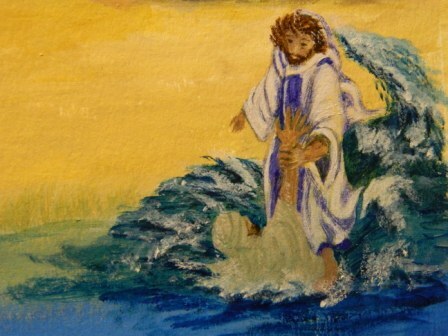 Since baptism symbolizes repentance, why did Jesus submit to water baptism? He was sinless. Listed are several reasons that come to mind. If you have other thoughts, I’d appreciate your comments. 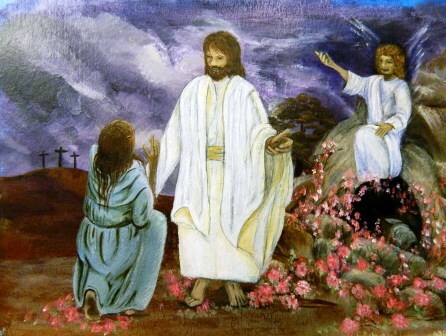 Jesus’ obedience to the Father opened the gate to heaven where the Father’s will is perfectly and completely fulfilled. Jesus willingly demonstrated complete submission to God through being baptized. He is our ultimate example. How about you? How have you demonstrated complete submission to the Father? Tomorrow, we’ll look another aspect of the example Jesus set for us. Prepare by reading and meditating on Luke 18:15-17—Jesus demonstrates compassion. Luz and Kasiff sat up straight with mouths agape. I swallowed hard and shivered, but not from the cold. My heart stopped. Run! Run, hide, save yourself. I tried to scream, but sat frozen to the ground. Slowly the sky returned to a black blanket studded with twinkling stars. The angels’ song faded. A few sheep bleated. The sleeping shepherds snored. I sat motionless, trying to comprehend what I had just witnessed. I sank my head in my hands, trembling, weeping, unable to stand. Luz lit a torch and led the way down the windy path into Bethlehem. The streets were quiet and dark. The only livery stable in town was at the far end. As we rounded the bend, a dim light shone from inside the stable. Instead of running, Luz slowed the pace, then paused a few feet from the entrance. While Luz and Kasiff stood in the threshold, gazing at the scene before us, I rushed in and knelt by the manger. There lay a baby wrapped in a tight blanket as the angel had said. Tears washed my face. This was not old shepherds’ wild imaginations. This was real. The angels had been real. The father smiled. The mother nodded. I kissed my fingertip and placed it on the baby’s soft cheek. The infant looked up at me. A rush of love, for I had no other word to describe it, flooded my soul. Immediately I knew I had touched the face of our God. Tomorrow, we’ll recap this weeks meditations via an art video. As the night closed in around us, I pulled a sheepskin around shoulders. The fire dwindled to a few ember coals. Snores and snorts rumbled from the lucky shepherds who had the privilege to sleep. Me? I drew the lot to keep the midnight watch with Luz and Kasiff—two of the biggest story weavers in all of Judea. At least the night would not grow dull. “I’m not a child. You need not protect me.” The men laughed as I sat on the ground between them. “Indeed, you are a man betrothed, so I hear.” Kasiff chuckled as he opened a pouch of figs and offered some to Luz and me. We each took a handful. “Favored, of course, as we all are. We are the Holy One’s chosen,” Luz spit out another seed and reclined on his elbows. 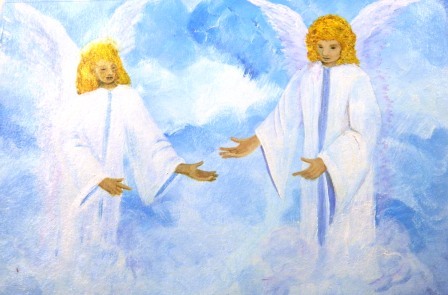 “The Holy One does care!” Kasiff’s voice deepened with aggravation. “Enough talk.” Luz silenced us. They both scooted a couple feet from me as though I had suddenly developed leprosy. The conversation heated everything but my body. I shivered as the last ember turned grey. I would not be tempted by sleep tonight. My fury quenched any drowsiness within me. The stars kept their watch like small candles in town windows. If only there were some sign of life in the heavens, then I would believe as the old men. A lone star shimmered. I blinked. It seemed to grow larger and draw nigh to us. I blinked again. 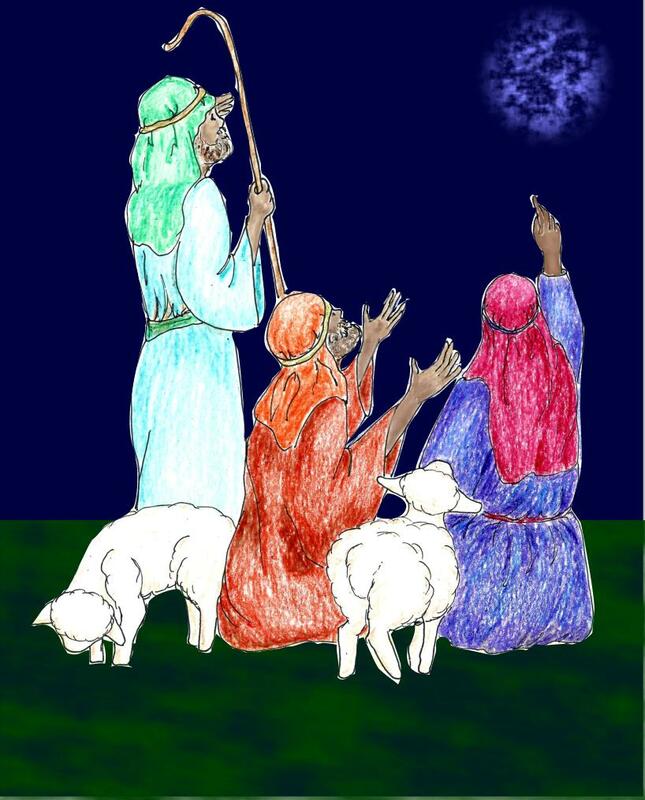 Shepherds often had night visions while on watch due to lack of sleep, I suspected. This was a first for me. The starry light took a form of … I rubbed my eyes. No, it couldn’t be … an angel, a messenger from the Holy One? I enjoy traveling, especially when someone else does the driving. Being a passenger is far less stressful. I like to watch the scenery, wonder where everyone is headed, and track our progress on a roadmap … when I’m not sleeping that is. Riding in a car makes me drowsy. I can nod off coming home from getting groceries. So most trips for me are pleasurable and restful. How pleasurable and restful do you think Mary’s trip to Bethlehem was? Bethlehem lay about 90 miles south of the small village of Nazareth. The young couple most likely traveled with other family members in a caravan. But keep in mind, they walked. It would’ve been at least a three-day journey, difficult enough for a healthy man. But think about a full-term pregnant woman. 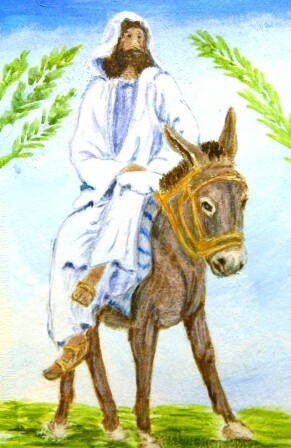 Granted, walking was the main source of transportation back then, but still, it couldn’t have been an easy trip even if Mary had a donkey to ride. Her journey to Bethlehem was not unlike our journey through life. Long days laced with discomfort, uncertainty, and even pain mark our path. However as Mary had Joseph to guide, protect, and comfort her, we too have friends and family who help us along the way. And like that young couple on their way to Bethlehem, we have a Heavenly Father watching over us. He may allow trials and hardships, but He has plans for each of us–“plans to prosper you and not to harm you, plans to give you hope and a future” (Jeremiah 29:11). How about you? Who has God placed in your life to guide, comfort, and protect you along your life’s journey? How has He used you to help others? Tomorrow, we’ll travel to Bethlehem with Mary and Joseph. You can prepare for the journey by reading and mediating on Luke 2:8-20. P.S. I didn’t forget about the painting. 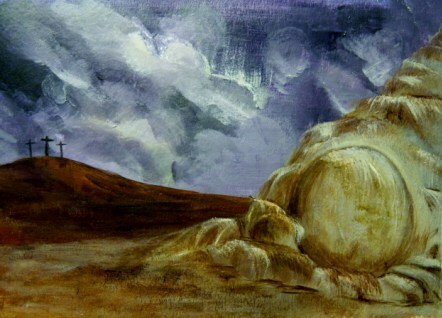 Today’s meditation didn’t render itself well as part of the painting for this week. I’ll add something tomorrow. Blessings. When my husband and I qualified for a better health-care insurance, we questioned everyone we knew who already had a similar policy. We wanted the reassurance that the company held true to their word. Aren’t we all like that when we receive an offer that seems too good to be true? Well at least we should be. It makes sense to check out the credibility of every business we have to deal with, bar none. Mary seemed anxious to check out the credibility of the angel’s message. Not that she was doubting God, but He had given her the opportunity for reassurance, and she took it. Mary’s elderly relative—cousin or aunt perhaps—Elizabeth found herself in the same predicament as Sarah and Abraham…unable to conceive. Now well beyond the childbearing age, Elizabeth and her husband Zachariah are promised a son and discover God keeps His promises. At the time of Mary’s visit, Elizabeth was in her sixth month. Now, it seems one of the main reasons God performed this miracle for Elizabeth and Zachariah was for Mary’s sake. He knew she’d need encouragement and confirmation that the Lord was really at work in her life. God’s very much like that, you know. He has a plan for each of us. And our relationships are so intricately intertwined that what He does for one benefits many others. That’s why are testimonies are so important. And why we should strive to recognize all God does for us. We never know how He’s going to use our blessings to bless someone else. 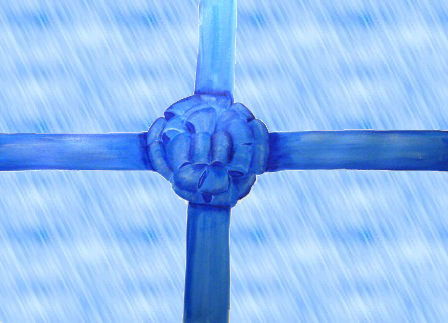 As we unravel the bow on God’s Gift this week, I’m beginning to see hope emerge. How about you? How have you shared the hope of your salvation with others lately? Tomorrow, we’ll travel to Bethlehem with Mary and Joseph. You can prepare for the journey by reading and mediating on Luke 2:1-7. God seems to talk to me more just before I fall asleep or sometime during those hours of subconsciousness. Why doesn’t He speak to me during waking hours? The answer is obvious. I’m too busy … busy with life, busy with trying to resolve my problems my way, busy with consulting friends for answers. I’m busy with things that consume my thoughts and prevent God’s thought to enter the equation. Perhaps that was Joseph’s problem too. When he learned about Mary’s pregnancy, he considered all the options, I’m sure. All the options he thought reasonable at least. Unfortunately, marrying an unfaithful woman was not among them. Joseph must have been so distraught about the news and torn by his love for her and his frustration and yes even anger. Yet, he thought to divorce her privately, wanting to cause her as little disgrace and hurt as possible. He must have loved her a great deal to have considered her welfare while believing she had been unfaithful and had disgraced and hurt him. That alone tells us a great deal about Joseph. He was a God-fearing man, a man of integrity. He believed in the promised Messiah and was devoted to Jehovah. And Joseph was as human as you and me. He tried to find the best resolution by his own understanding. That’s why God sent an angel to him in a dream. That’s when we find out all we need to know about Joseph. He believed the angel and did as the messenger told him. He married Mary immediately. Joseph was a man of faith. And he acted on his faith. How about you? Have you been trying to resolve your problems without seeking God’s will? Are you a person a faith who acts according to your faith? In preparation for tomorrow’s meditation, read Luke 1:39-56. 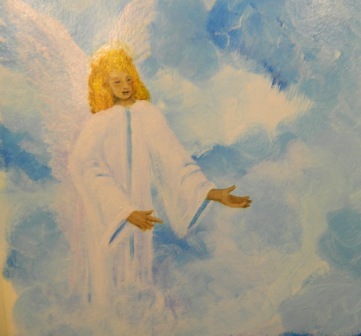 If an angel appeared to you, how would you react? Good question and one we couldn’t honestly answer unless it actually happened. Nevertheless, we can speculate. Fear is the first thing that comes to my mind. No matter what we think our reactions would be, fear would be among them. Every incidence recorded in the Bible where it mentions angels appeared to humans, it also states those who saw the celestial beings were afraid. Mary must have been no different for the angel says “Do not be afraid.” So it stands to reason that if we saw an angel, we’d tremble with fear. The next thing we learn about Mary is God noticed her everyday behavior. She was highly favored. She obeyed His laws with a willing, respectful heart. She no doubt believed God kept His promises and He would send the Messiah. However, when the angel announced that she would bear a son, Mary questioned the logic of the proclamation. Wouldn’t you under the circumstances? How could she have a baby when she was a virgin? She was engaged. She could’ve assumed God meant after she and Joseph were married she’d conceive. But she knew immediately that wasn’t what the angel meant. Therefore, she questioned the logic of the message. I don’t know about you, but I’ve been taught that questioning God was wrong. I never bought into that mindset, and I hope you haven’t either. God does the impossible. And when He lets us in on the plan, questions arise in our spirits. It’s okay. He didn’t get angry with Mary. And He won’t get angry with you or me if we question the “hows,” “whens,” “wheres,” and even the “whys” of the procedure. He gave us intelligent, inquisitive minds. I believe He delights in our questions as a father delights in his curious child’s questions. God enjoys answering our sincere questions and wants to quiet our deepest concerns. The angel quieted Mary’s concerns with his answer, “The Holy Spirit will come on you, and the power of the Most High will overshadow you. So the holy one to be born will be called the Son of God” (Luke 1:35). If it would’ve been me, I would’ve been full of even more questions. What’s my finance going to say about this? What about my parents? Are you sure you got the right Mary? There’s like a bazillion Mary’s in Judea, you know. How about you? When you have a Mary-moment, how will you respond? In preparation for tomorrow’s meditation, read Matthew 1:18-25. Advent has begun … the time of year when we reflect upon and look forward to God’s gift to humanity. It’s a glorious time of year. Smiling, singing, decorating, gift-giving people fill our communities. But what if we never opened the gifts? Instead, we’d just sit around and talk about how beautiful and amazing the wrapping was. Kind of absurd, huh? However, that’s what we seem to do at Christmas time. We get all hung up on the wonder of the package and forget to look inside. God’s gift to humanity is so much more than an angel speaking to a virgin, that virgin giving birth, and shepherds witnessing a chorus of angels singing praises to God. This Christmas, I’d like to look at the gift—Jesus the Messiah, the Son of God—and why the gift was given. Let’s start there … the reason for the season. Some say, “Jesus is the reason for the season.” But they’re wrong. We are the reason for the season. It was God’s plan since the fall of man to send a redeemer into the world to save all mankind from their sins. (See Genesis 3:15.) People understood God would send a redeemer from the beginning. When Lamech had lived 182 years, he had a son. He named him Noah and said, “He will comfort us in the labor and painful toil of our hands caused by the ground the Lord has cursed (Genesis 5:28-29). Throughout the Old Testament, God spoke to the prophets about His plan of salvation and our need for a Savior. God is holy. He cannot allow sin in His kingdom, nor can He look upon it. But He loves us with an everlasting love. He wants to have fellowship with us and welcome us into His kingdom, but He can’t because we’re all sinners. His only solution was to destroy our sins without destroying us. As we ponder the reason for the gift, let’s spend the Advent Season looking at the Gift. In preparation for tomorrow’s meditation, read Luke 1:26-38. Thank you Sheri. I do have a “follow my blog via email” button listing in the column on the left. Just scroll down a little and you should see it. You’ll receive an email every time I post. You can also follow via Network blogs and RSS Feed both buttons are in the left column a little farther down.